Hi, everyone! 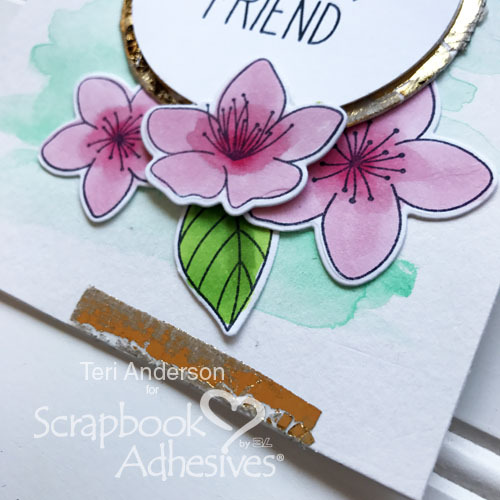 Teri here with a stamped card featuring some distressed foiled accents that are easy to make with products from Scrapbook Adhesives by 3L®. 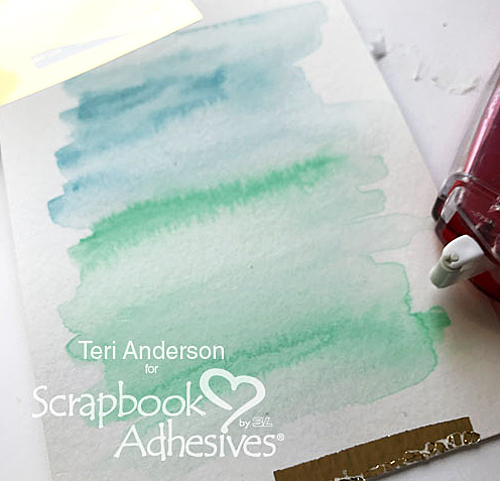 Let me show you how you can make your own accents for your next card or scrapbook page! The circle is easy to recreate! Start by cutting two circles from cardstock. One should be slightly larger than the other. Stamp a sentiment on the small circle. Set it aside. Take the larger circle and place it on scratch paper. Run several lines of adhesive along the edges with the E-Z Runner® Grand Refillable Dispenser. It doesn’t have to be perfect. Don’t fret if you miss a spot or put too much adhesives on the circle. Take a piece of foil from the 3D Foam Creative Embellishment Kit. 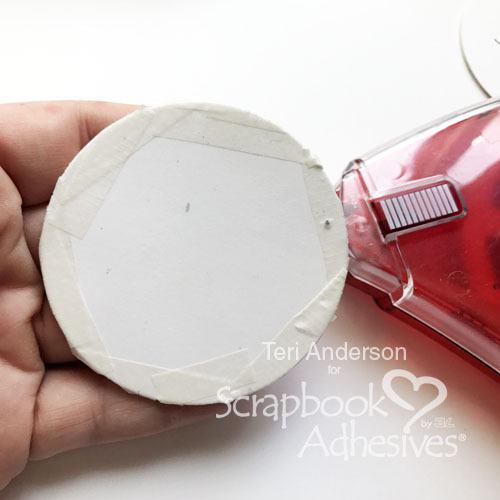 Set it over the adhesive and burnish it to the circle with your fingers. (A bone folder works well for burnishing too!) Again, don’t worry if you don’t get foil on all the adhesive. Now, comes the fun part! We get to distress! Take a nail file and lightly sand the foil and adhesive. Keep going until it’s distressed as much as you want it distressed. 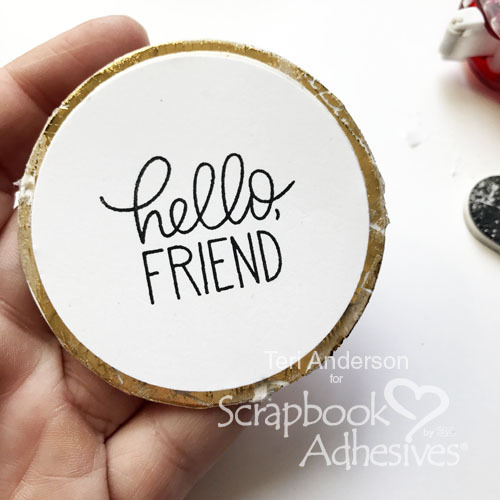 Adhere the circle with the stamped sentiment onto the distressed foiled circle and mount it to your project. Want the sentiment to pop? Consider adhering it to the larger circle with Crafty Foam Tape White or Crafty Foam Tape Black rather than the E-Z Runner® Grand Refillable Dispenser. Another fun Distressed Foiled Accent to create is faux Washi tape strips! These are so easy! 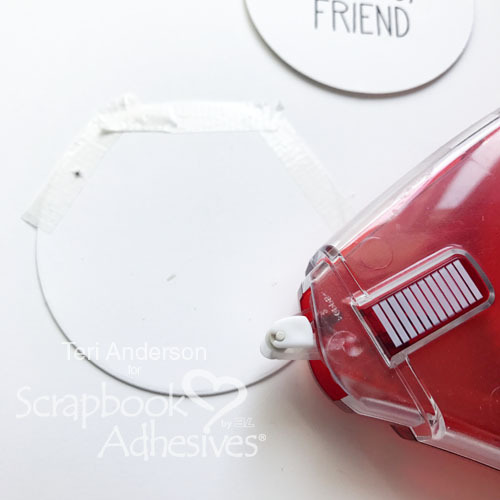 Simply take the E-Z Runner® Grand Refillable Dispenser and run a couple strips of adhesive along the top and bottom of your card or scrapbook page. Set some foil on top and burnish it with your finger or bone folder. Remove the excess foil and use a nail file to distress the foil. Keep going until the foils looks as distressed as you would like it to be! Remember, the more you sand the foil, the greater distressed it will be. 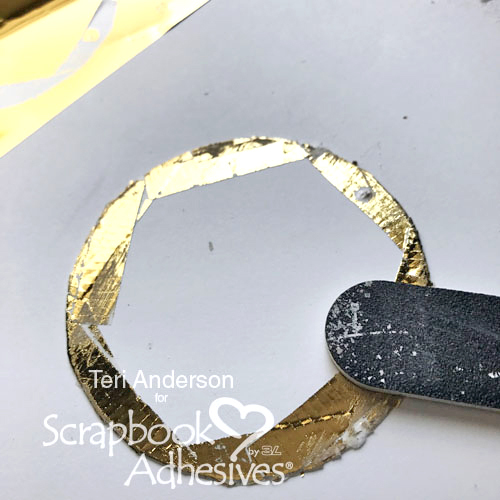 I hope you are inspired to make your own distressed foiled accents for your next project. 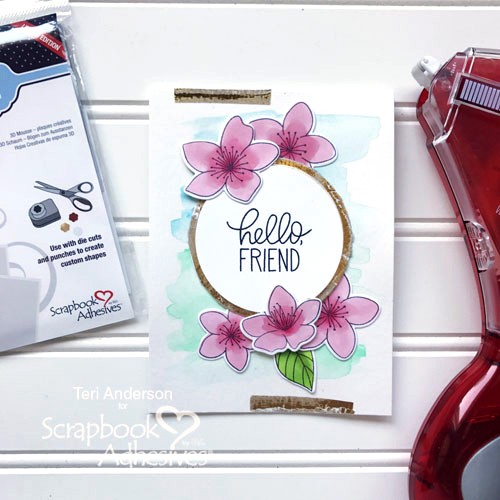 Just a few of these accents can add a whole lot of style to your cards and scrapbook pages without putting a lot of work into them! This entry was posted in 3D Foam Circles, Adhesives, Beginner, Cards, Crafts & Tutorials, E-Z Runner® Grand, Permanent Adhesive, Skill Level, Tutorial, Wear your Adhesive on the Outside and tagged 3D Foam Circles White Mix, 3D Foam Creative Embellishment Kit with Foil, Card, Card Making, Craft Foil, E-Z Runner Grand Dispenser, E-Z Runner Grand Permanent Strips Refill, E-Z Runner Permanent Strips, E-Z Runner Permanent Strips Refill, E-Z Runner Permanent Strips Refillable, E-Z Runner Permanent Strips Refillable Value Pack, Pretty Pink Posh, Prima Marketing, Spellbinders Paper Arts, Stamping, Teri Anderson, Tutorial, Watercolors, Wear Your Adhesive on the Outside. Bookmark the permalink.